What a ride this book was. I selected it from a list of possible titles for the month because the synopsis looked like I’d be able to relate on a few levels to the author, Mo Isom. I’m thinking specifically of the terrible car accident she experienced, but I figured if I could relate to even one part of someone’s story on a deep level, it would be a good autobiography to read. What I did not expect was how this book would wreck me. Mo Isom described that car accident in such detail that I put the book down and didn’t pick it back up for almost two weeks. Her struggle with her quest for control of her life and using food to get there, though to a much deeper extent than mine, resonated hard with me, and I put the book down again. To be perfectly honest, I nearly didn’t finish the book. It was such a roller coaster of emotions for me, in a way that no book has ever wrung me before, that I just didn’t want to deal with it. It felt too overwhelming. I highly recommend this book to anyone who has ever struggled behind closed doors with anything, whether you can relate to her circumstances specifically or not. It’s worth the read right to the very last page, as I found the last chapters so deeply encouraging. I find that I’m filled with empathy for Mo’s story, and yet I’m so glad that she’s been able to find the good so that she could share that with so many people in ways she’d never have seen coming while she was planning her own life. Recently, I’ve been looking to take thisblogisepic in a bit of a different direction. I’m really excited to get into reviewing books, which gives the added bonus of forcing me to read since now I have deadlines! I’ve been meaning to read more, too…. I’ve joined this program called Nuts About Books run by Graf-Martin Communications (a Christian publishing company). They send me a list of books they’re offering, I choose what I’d like to receive, and they mail me copies of the book(s) that I then have a month to review! I’m ready with my very first book review, and I’m glad to say that it was a good book. I was nervous starting out…. what if you don’t like a book? Then you have to publicly display your thoughts even though they aren’t great because you signed up to be honest… but thankfully I quite liked my first book (and have another to read in the next 6 days… whoops. I’ll need to be more on top of this next month). 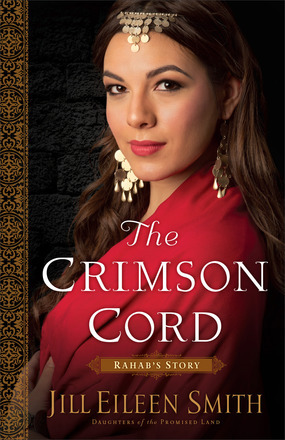 I read The Crimson Cord by Jill Eileen Smith. It’s an Historical Fiction novel centered around the story of Rahab, the prostitute who gave safe passage to Hebrew spies in Jericho in exchange for safety for her and her family. I admit that going into this book, I knew nothing about Rahab’s story other than just that — that she was a prostitute in Jericho at the time of Joshua, and then something about tribes of Israel marching around the city for 7 days until the walls fell. That’s it. Rahab isn’t mentioned that often in the Bible, so while I knew going into this book that a lot of details would be filled in by the author, I dare say she did a beautiful job at crafting a great story out of the life of Rahab. I especially appreciate the ability to glean a deeper understanding of what life would have been like for a woman in Old Testament Jericho. The Historian in me loves it, and I found that Smith struck an excellent balance between historical detail and creating beautiful, relational characters. It started out a hard read, but only because lately I’ve been asking God to give me a heart for the things that breaks His, and one of those things has been a heart for women stuck in abusive situations and relationships who can’t get free. At least the way it was written here, it spins Rahab’s life story very much in that light, but I feel that it was done very tastefully. My favourite part of the book, without giving anything away because I really do encourage you to read it if you like historical fiction at all, was how much the Grace of God was highlighted. Normally, I see the Old Testament and the New Testament as very different things. I know that my God is the same yesterday, today, and tomorrow, so in theory I have a deep understanding that the God of the Old Testament was still full of Grace, but I often forget that. Much to my chagrin, I suppose. The way that Jill Eileen Smith wrote this story really clearly showed that God was very much still a God of Grace during the time of Joshua, just like He is now. Rahab was not an Israelite. She didn’t need to be granted safe passage during the attack on Jericho, but she was, along with her family, because of her faith, and God continued to cleanse her and reward her faith through the rest of her life. Toward the end of the book I became curious about Rahab’s family tree as the rest of the story started to unfold, and learned interesting facts in my search there as well. If you pop on over to here, you’ll find what I found — that Rahab is directly involved in the line of King David (and therefore the line of Christ), and I just sometimes can’t wrap my mind around how amazing God’s grace really is.